At Astellas, we are dedicated to supporting and improving the lives of those impacted by cancer. One of the ways we provide this support is by working with patient advocacy organizations, such as The Leukemia and Lymphoma Society (LLS) – the world's largest voluntary health agency dedicated to blood cancers, including leukemia, lymphoma, Hodgkin's disease and myeloma. 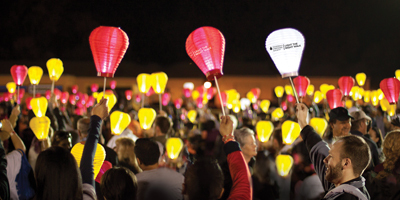 To help brighten the darkest moments of patients’ cancer treatment journeys, LLS created the Light The Night campaign. A series of fundraising walks across the country, Light The Night benefits research to find blood cancer cures and improve the quality of life for patients and their families. Sharing LLS’ mission to expand cancer research and support resources for patients, Astellas sponsored various Light The Night walks throughout October and November. At various Light The Night events, Astellas featured an employee-staffed booth to highlight our efforts to change tomorrow for patients. The booth also encouraged attendees to consider how they will change tomorrow to make a positive impact on the cancer community and society as a whole. Learn more about LLS and their mission to cure blood cancers by visiting their website here.